Application Areas : A variety of dining tables, coffee table, desk, conference table Teng. Material: PVC and fibre. Washing Advice : Contaminated with traces of oil stains can be gently scrub with detergent, rinsed with water or scrub brush; it can not be forced to scrub, hanging in a well-ventilated place to dry, it can't be exposured. 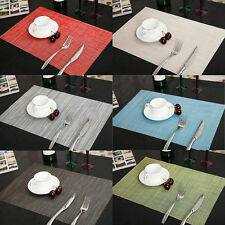 This is a set of 4pcs antiskid dining table placemats. It's really a good helper in your kitchen. - NOTE: Thermo sensitivity placemat, soften when heating, does not affect normal use. - Material: PVC. This placemat is a must have for your Christmas dining table! Adopted from premium pvc and designed in lifelike lotus leaf shape, the mat has a good function of practicability and decoration. Featured with anti-slip and heat-resistant, it can be placed under hot dish, cup, bowl and other tableware on dining table to avoid the desktop scratches. 4 x Placemats. 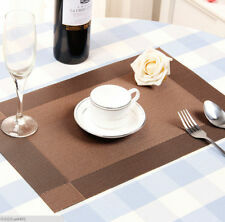 Simple & elegant matts design is one of essential item for your dining table. Washing Advice : Contaminated with traces of oil stains can be gently scrub with detergent, rinsed with water or scrub brush; it can not be forced to scrub, hanging in a well-ventilated place to dry, it can't be exposured. Decorative: Gilding design makes the placemat be a great decoration for table. 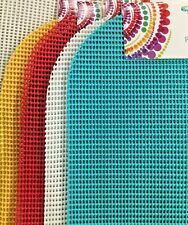 This placemat is made of PVC which is anti-slip and high temperature resistance. - Material: PVC. - High quality: Made of quality PVC plastic, waterproof, anti-slip, high temperature resistance and safe to use. Decorative: Gilding design makes the placemat be a great decoration for table. We will solve your problem as soon as possible. - Table protection: The mats protect table from high temperature. 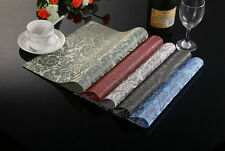 This placemat is made of PVC which is anti-slip and high temperature resistance. Protects the table top surface and reduces noise from plates and cutlery. Material ： PVC. We will reply as soon as possible. Your recognition will encourage us greatly and serve you better. We will do our best to correct any mistake and resolve the problem.